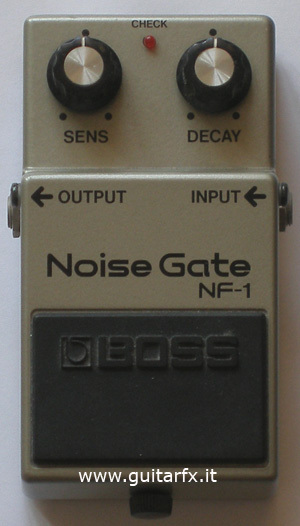 This is a simple noise reduction unit, the first one in Boss compact pedals line-up, and can be used to get rid of background noise and hum during silent passges while playing. It has been sold from 1979 to 1988, while right now the only compact noise-reduction system is the NS-2. The NF-1 has two controls: Sens and Decay. Sens (for Sensitivity) sets the threshold for intervention, while Decay sets the intervention time after last signal, from 100 msec to 1.6 seconds.